For all those people who are interested in the Junior Eurovision Song Contest, here are the results and details for 2010. The eighth Junior Eurovision Song Contest took place at the Minsk Arena, Minsk, Belarus, on Saturday 20 November 2010. The contest last approx 2 hours. Denis Kurian and Leila Ismailova, hosted this event. 14 Countries took part. Moldova is a new country to Junior Eurovision. Guest apperance were from Alexander Rybak (2009 Norway winner) and Dmitry Koldun (2007 Belarus entry) as well as all the winners of Junior Eurovision since 2003. The winner was decided by televoting and a jury (which made up about 50% of the vote), as like the main Eurovision Song Contest. All voting cost goes toward unicef. The 2011 host will not be the winner of the Junior 2010 contest. 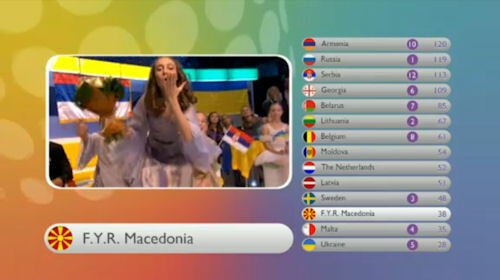 Here are the songs and artist who entered the 2010 Junior Eurovision Song Contest and their final score. (*) Indicate the number of times that a country was awarded 12 points. Also note that every country had 12 points to start off with and are not indicated below. None of the Big 4 countries enter the 2010 contest so viewers in those countries had to watch the contest via the internet, difficult if you like the X Factor in the UK.